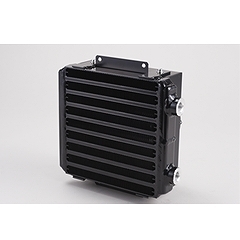 ATK | Air-cooled type | Heat exchangers | TAISEI KOGYO Co., Ltd.
An air-cooled oil cooler that is ideal for environments where cooling water cannot be used. Rated voltage Select single phase 100V or 200V×50/60Hz Single phase 115V, 120V, 220V, 230V are built-to-order. *Inquire about DC.